First of all, the whole reason for implementing the garbage collection mechanism is to reduce memory usage by cleaning up circular-referenced variables as soon as the prerequisites are fulfilled. In PHP's implementation, this happens as soon as the root-buffer is full, or when the function gc_collect_cycles is called. 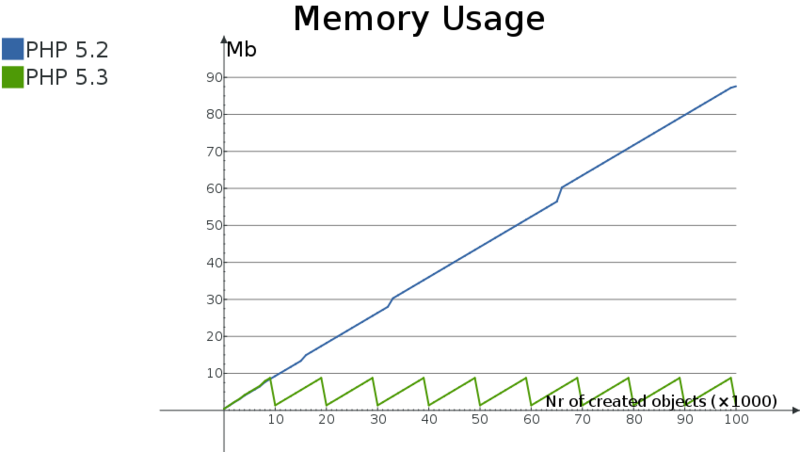 In the graph below, we display the memory usage of the script below, in both PHP 5.2 and PHP 5.3, excluding the base memory that PHP itself uses when starting up.